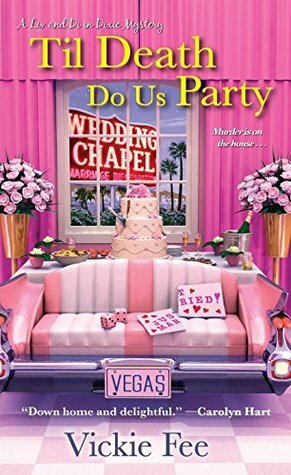 Til Death Do Us Party by Vickie Fee, is the fourth book in the Liv and Di series. Liv McKay is a party planner from Dixie, Tennessee. She has her own business called Liv 4 Fun. Di Souther is Liv's best friend and fellow sleuth. In this book Liv, with family and friends, flies to Las Vegas for her mother's wedding. Her mom, Virginia and fiance' Earl, want to be married at a Vegas chapel with an Elvis impersonator to officiate the nuptials. When the impersonator is murdered, it's up to Liv and Di to find the killer in this unfamiliar city. This is the first book of this series I have read. I didn't feel lost at all. I was able to follow the story and the characters felt like old friends. They were quirky and brought so much humor and fun to the story. Liv's mom was boisterous and spunky. I was laughing from start to finish. The mystery kept me on the edge of my seat, and with its twists and turns, it kept me guessing until the end. There were also party tips and recipes included. I would recommend this book to anyone who loves a cozy mystery with quirky characters, funny situations and laugh out loud fun. I have recommended this book in my review. I do intend to read the others in this series because this one was so fun. Now I want to start with the first one to see how it all began.